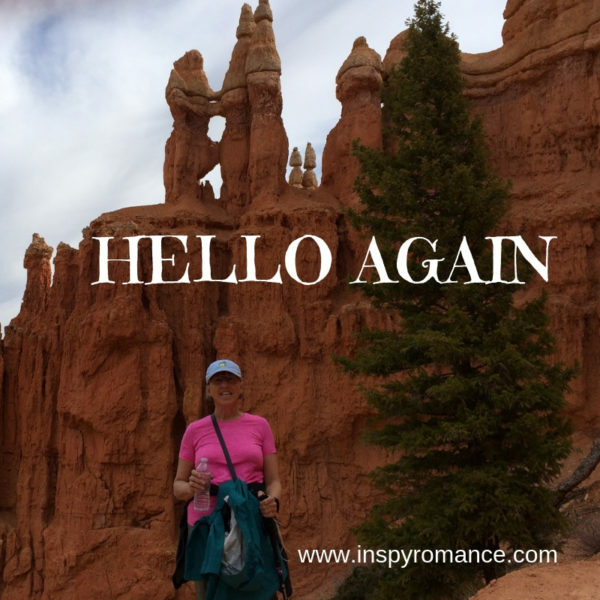 After an eighteen-month hiatus, I’m pleased to be back with the Inspy Romance authors. The last post I made here on the blog was in 2017 just a few days before we took a month-long trip to Australia and New Zealand. I’d love to share all of my photos, but I’ll settle for just one. I’m up close and personal with a koala bear. It was just one of the highlights of my trip. Also at this same animal preserve, a kangaroo kicked me. I’m sorry, but there are no photos of that to share. Hubby wasn’t prepared with a camera when it happened. The first photo was taken in Bryce Canyon National Park in Utah. Last April, we went with friends and visited all five national parks in Utah. The scenery is varied and spectacular, God’s handiwork on display. Besides, these two trips we made several trips to the east coast of the US to see our daughters and their families. Now that they both live on the east coast, we’ll be racking up the airline miles to visit them. A trip to see our daughter in Baltimore also included a trip to Washington, DC, and a visit to the Museum of the Bible. If you get a chance, it’s a must-see museum. Here is a photo of some of the translations of the Bible. There may be even more since our visit. 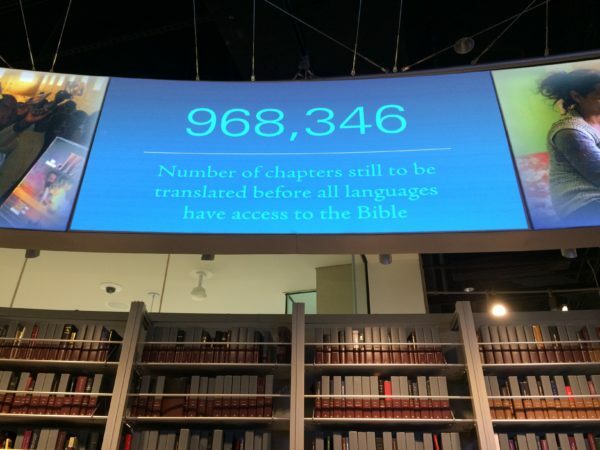 The Wycliffe Bible Translators are a very important part of making many of these translations, but as you can see from the photo, there is still lots of work to do. I could share so many more trips, but I’ll spare you the vacation photos for now. You’ll probably see more in future blog posts. 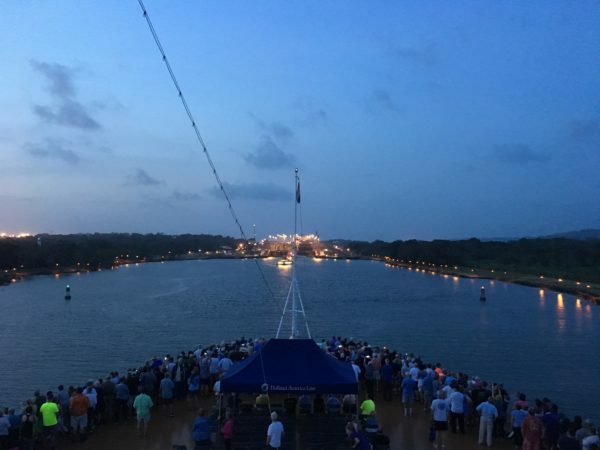 I’ll share just one more from our latest trip, a cruise to the Panama Canal. Here is a photo as we approached the first lock. Besides traveling, I’ve been writing. During our trips, my trusty computer travels with me, and I grab whatever time I have to get a little writing in. While we were in Australia, I did the final edits for A Song to Call Ours before sending it off to my editor. Also on that trip, the story idea for the next book in my Front Porch Promises series, A Baby to Call Ours, came to me almost full-blown, and that rarely happens because I am not a plotter. I’ve also received the rights back for several of my Love Inspired books, and I have been reissuing them. The three books in the Kellersburg series are already available. You can read a little story behind the story about that series here. Now I’m in the process of reissuing the books in my Dalton Brothers series. Book two of the series, Country Blessings, releases today. You can find buy links here. What do you like best about books in a series? I am giving away an e-book copy of the first book in my Kellersburg series, Hometown Promise, to one person who leaves a comment. I will draw a winner on April 11, 2019 at 9PM MST. Hi Merrillee, Welcome back to Inspy Romance. :) The photo of the koala is adorable. I’m sorry you met an ill mannered kangaroo during your trip down under! I look forward to seeing more of your vacation photos in future posts. Thanks, Narelle. We got a big laugh out of the kangaroo. Hi Merrillee! Welcome back to Inspy Romance. Thanks for sharing your vacation pics. 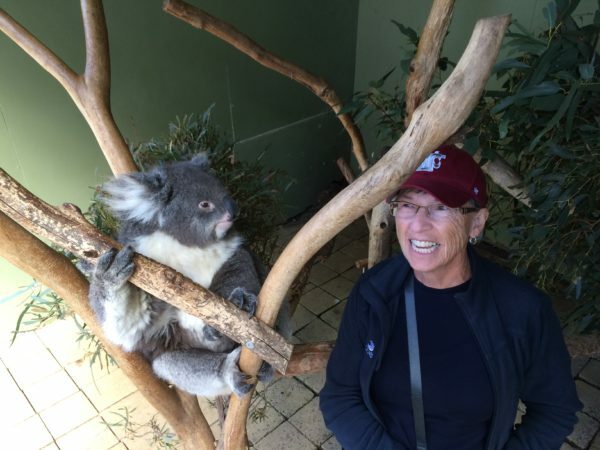 Cute expression on your face with the koala bear. I enjoy books in a series with an unique common thread – location, food, paintings. Your front porch series – the rocking chair. Best wishes. Renate, thanks for the welcome. I always like to revisit characters from previous books in a series. Hi Merrillee welcome back. what I love best about series is finding out what happens next or if its different characters from the previous books its seeing past characters and what they are doing. The only time I don’t like series is when they don’t mention previous characters and may be in the same area but are totally stand alone books with no reference to previous books. Jenny, thanks for the welcome. I also like to revisit characters from previous books. Hmm, I love series because I enjoy the connections between characters- hearing more about characters from previous books, or getting glimpses of characters in future books. It is also fun seeing what connects the stories and how this is explored in each book. Wemble, thanks for the welcome. I too love the connection between characters. Hello. I followed the pictures you shared on your trips. Thanks for sharing. The nice thing about a series is visiting a place that you have been before and learning something new. I already have this book. Gina, I’m glad you have enjoyed the photos. There is something nice about starting a book and seeing something familiar but also knowing you will see something new. I love series because I feel like I get to revisit my dear friends and see what they are up to now! Paula Marie, it is nice to revisit characters from previous books. They’re like old friends. What I like more about series is seeing what happened to the characters present in the former books, find out how’s their life, what they’ve been up to. Something like catching up with old friends. Laura, thanks for the welcome. Yes, it is like visiting with old friends. Welcome back. What wonderful vacation memories. Thank you for sharing. Lelia, thanks for the welcome. Jessica, thanks for the welcome. It has been a fun 18 months for sure. You had a very eventful year! Many years ago I visited Stanley Park in Vancouver BC and saw a couple of kangaroos. They were so fast! I can’t imagine how much it hurt to get kicked by one. Welcome back, Merrillee! What an exciting set of travelling you’ve done in the past couple of years. The Panama Canal cruise is on my bucket list. Valerie, thanks for the welcome. The traveling has been really special, moments I will remember for a long time. How wonderful that you can go see your daughters like this. Ohh to be this close to a Koala. Ouch, that must have hurt when said kangaroo kicked you. What a wonderful trip you had. Thanks for sharing some with us today. Lori, I’m thankful that even though we live far away that we are able to visit our daughters numerous times a year. The kangaroo didn’t really hurt me, just gave me a big shove with her hind feet. I didn’t see it of course, but hubby did and told me what she’d done. Susan, I agree with you. I like when books can be read alone, but it’s nice to read the series and feel connected to all the characters as they interact through the series. I love the koala picture! The thing I like best about a series is that I don’t have to say good-bye to a place or characters as quickly as I do in a stand alone. Ellie, not having to say goodbye is an excellent reasons for liking a series. I love that photo of the koala, too. It makes me smile. Welcome back. Thanks for sharing your stories and beautiful pictures.